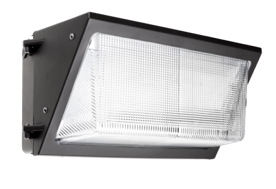 The Aleo WPE2™ Series Large LED Wall Pack Lighting Luminaire combines energy-efficiency, high performance, and rugged construction with a familiar and traditional look to deliver enhanced performance to outdoor wall-mounted lighting applications. Rugged die-cast housing provides advanced thermal management for long life and weather-proof compartment to withstand challenging, outdoor environments. Traditional look helps to maintain familiar building aesthetics..
High performance LED platforms delivers high efficiency and long life. Prismatic glass lens designed for superiorHigh performance LED platforms delivers high efficiency light distribution and uniformity. Type IV VS comes standard. The Large LED Wall Pack Lighting Luminaire utilizes high-efficacy LED packages maintained at cool temperatures for long life, high efficacy. Reliable driver features universal voltage (120-277V) for convenient installation. The Large LED Wall Pack Lighting Luminaire is Designed to be wall-mounted higher than 4-ft. from the ground. Luminaire to be mounted directly over standard 4” junction box (supplied by others) or surface mount and wiring connection through convenient 1/2” threaded conduit entry hub.